Castle Rock feels exactly like a Stephen King novel. That was the intent all along, as it's set in the same eponymous fictional town as exemplary King works Rita Hayworth and the Shawshank Redemption, The Body, Needful Things and Cujo. Hulu's 10-episode anthology series has that same sleepy New England feel, where local charm besets a story of entrenching -- or long-buried -- evil. It may not be written by King, but it's made of the same stuff, and set -- quite literally -- in the same labyrinthine multiverse he's spent his life concocting. The most fascinating element of the series has got to be "The Kid," the mysterious figure at the story's center. As played by Bill Skarsgård, The Kid is a bone-white, paper-thin, hulking figure found caged in an abandoned block of Shawshank Prison. He has no name, no memories, has left no paper trail. He's discovered after the prison's warden, Dale Lacy (Terry O'Quinn), commits suicide, a question mark with ties to the town's long, dark history. The Kid's sudden manifestation summons Henry Deaver, a Castle Rock native who fled the town long ago. Deaver's own mysterious past -- his disappearance as a child, and its ties to his adopted father's death -- feels connected with the prisoner's. 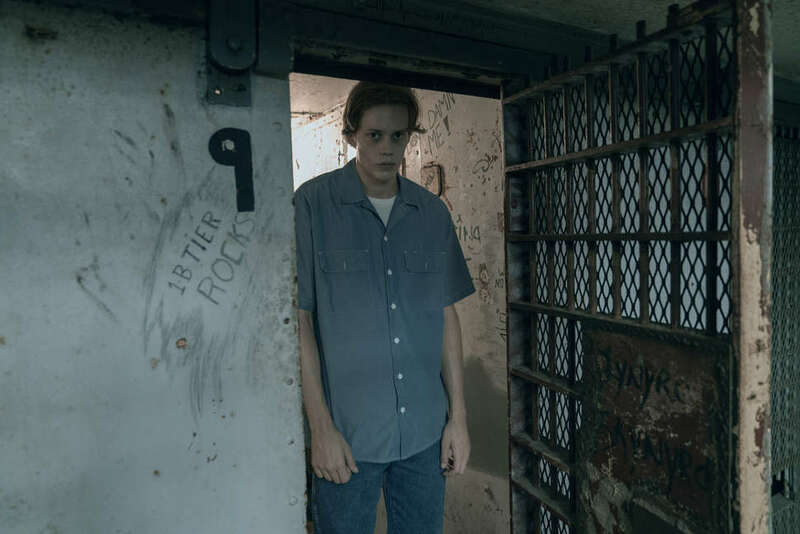 We don't know much about The Kid so far, and the show's creators Sam Shaw and Dustin Thomason have been cagey about his true identity, saying only that he's an original character. 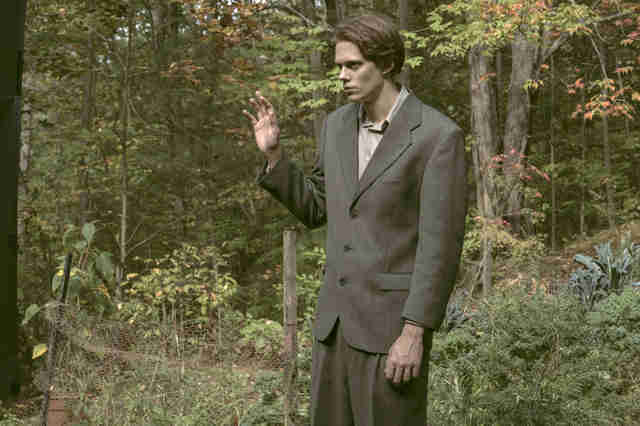 But Bill Skarsgård let a little more slip at Comic-Con this year, when he teased that the character also has a "mythological connection" to one of King's works. Is that a specific connection or something more tangential? Here are some guesses at characters who may have inspired The Kid, or other identities he may have based on King's lexicon of mythology. This may sound nuts, but there's actually a lot to support the idea that The Kid is actually Pennywise from It. Skarsgård is the obvious link, since he plays the maniacal clown in the recent film adaptation. Is it possible he was tapped for Castle Rock because of this, and the creators are holding out for a flashy reveal that the show and movie are canonically linked? Here's why it could work: Henry Deaver disappeared in 1991. If Castle Rock is set in the present, then it's been 27 years since those events. In It, the titular creature (who takes many frightening forms, but is most frequently seen as Pennywise the Dancing Clown) lays dormant for 27 years before reemerging to wreak havoc on the people of Derry, Maine. In the book, it's only Derry that falls victim to this malevolent force, but it's possible Castle Rock is merely transporting the story from one Maine location to another. Remember that Pennywise, like The Kid, can also infect people with disease and use mind control. However, it's doubtful Skarsgård would play the same role in two different mediums this close together, especially since he's spent recent press rounds remarking on how he was drawn to The Kid because he's so different than Pennywise. "As soon as I read the pilot, I [realized] it was a completely different world, an original world, and this character is so different than the character I just played," Skarsgård told press at San Diego Comic-Con last month. "Incredibly different. This character couldn't be further away from Pennywise, who's all, like, 'Baaaaaa!' and this guy's so reserved." The theory would also mess with the mythology of It, since the inter-dimensional creature doesn't lay dormant as a human, but rather disappears entirely during that 27-year-gap. In the end, It is a story about Derry, not a story about Castle Rock. Anything could happen, but this one seems pretty unlikely once you start poking holes. 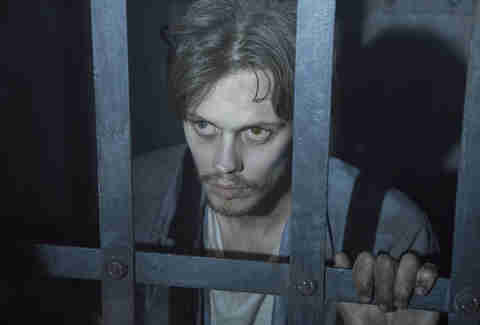 There are major religious undertones on Castle Rock: Henry's adopted father, Matthew, was a reverend; Jackie volunteers with a local church group; Dale Lacy, after capturing The Kid, refers to him as "the devil." And what if he's right? It would be a very King-like thing to bring evil to small-town Maine in the form of a gaunt, mysterious man. (Leland Gaunt of Needful Things, anyone?) We're led to believe Lacy's protestation that The Kid is the devil is probably a red herring, because it comes so early in the season and seems too clean. But maybe it isn't. Maybe The Kid is a pure embodiment of chaotic evil, sent to Castle Rock to punish the town for its sins. That would be very in keeping with King's mythos. Another clue: In episode four, "The Box," when Alan Pangborn returns home to Ruth, there is an episode of The Twilight Zone playing on the TV in the background. The episode is called "The Howling Man" and is about a group of monks who have trapped a man in a cage, insisting he's the devil. When a traveler wanders into the monks' castle, he hears the story but disbelieves it, and sets the man free -- only to discover that he was, indeed, the devil. As one of the monks explains, the inability to recognize the devil has always been man's greatest weakness. Is this Twilight Zone episode a clue about The Kid, or about someone else? Even avid King fans might not recognize this name, since it comes from a miniseries and not a novel or short story. In the 1999 ABC miniseries Storm of the Century, Andre Linoge is the name of a powerful wizard who comes to the town of Little Tall Island, Maine in the middle of a deadly blizzard. Linoge is captured and held in a cell, but uses his magical abilities to drive townspeople to suicide, and has an ability to control their minds and dreams. It is eventually revealed that he's in town to find a protege; since he is not immortal, he needs to mentor a child to continue his life's work. In a lottery-style drawing, the constable's son, Ralph, is taken by Linoge and they disappear together. Storm of the Century is eerily similar to Castle Rock in a lot of ways. For one, Henry Deaver reappeared on Castle Lake in the middle of a powerful blizzard, the same scenario as the miniseries. Also, The Kid's abilities are much like Linoge's; both are locked in a prison cell but still able to affect those on the outside. It's possible that The Kid is a Linoge-like character, that he's a grown-up Ralph, or that he's another of the wizard's proteges. Another thing to note: The town of Little Tall Island is shown on a map in Castle Rock's opening credits, with the words "Storm of the Century" written in red beneath it. Castle Rock has referenced plenty of King works so far, but one curious omission has been The Dark Tower series, his eight-book fantasy epic that first introduces the concept of a multiverse. All of King's stories exist in this multiverse, connected by the fabled tower, which contains every reality. The main antagonist of The Dark Tower is Randall Flagg, a villain who pops up constantly in King's oeuvre. He's also the main villain in The Stand, and appears or is mentioned in The Eyes of the Dragon, Salem's Lot, and Hearts in Atlantis. Flagg assumes many different forms and goes by many different names. Like Linoge in Storm of the Century, he is also associated with the demon Legion. ("Linoge" is an anagram for Legion.) He has supernatural abilities, like necromancy, and is able to see into people's minds. The Kid is without Flagg's trademark charisma, but perhaps he is an imported version of the character, who stepped into this world from another in the Tower, and has yet to fully emerge. 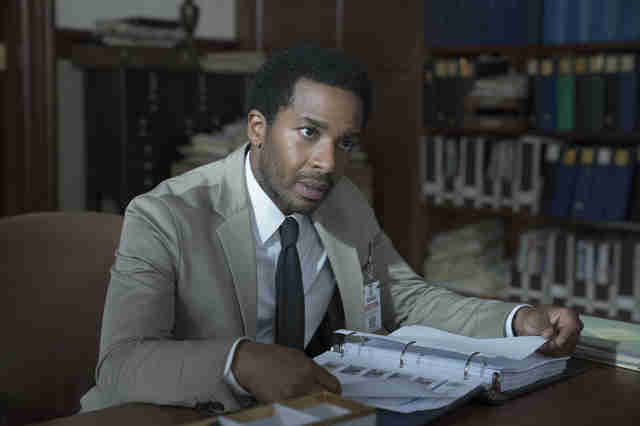 On the show and in press photos for Castle Rock, The Kid appears to have heterochromia, or two different-colored eyes. This wouldn't be all that notable, except that Bill Skarsgård does not have the condition in real life, meaning it was a deliberate choice to give the character one brown eye and one blue eye. Why? This might correspond with another theory floating around. What if the real Henry Deaver is trapped inside of The Kid's body? Think about it: The Kid turned up around the time Henry went missing. We never see exactly what happened when Dale Lacy "captured" the boy. We only hear about it when Alan Pangborn talks to Shawshank's new warden: "[Lacy] said he'd always thought the devil was just a metaphor, but now he knew the devil was a boy. And old Dale said he'd caught him and locked the devil in a box. And from here on out it was blue skies and butterflies." The word choice there is significant to this theory. Pangborn says "a box" instead of "a cage." If you recall, in episode four, when Henry visits the home of Vince Desjardins -- a suspect in his disappearance case -- he finds a literal box behind the house where it looks like a child may have been imprisoned. If we put all of these clues together, it's possible that Lacy and Matthew Deaver somehow learned that young Henry was the devil incarnate, and staged a kidnapping. In order to prevent town panic in the event of the boy's death, they figured out how to transfer his soul into another vessel: The Kid, who, in this scenario, is either an unlucky Shawshank prisoner ripe for experimentation, or some other low-life person they weren't afraid to sacrifice. They then imprisoned him deep in the bowels of Shawshank Prison, and let the devil-less Henry free. Something went wrong with Matthew -- maybe whatever process was used to make the transfer had a toll on his body -- and he died, and Lacy had to live with the guilt. Perhaps this is why he eventually killed himself, and his last words to The Kid were to ask for Henry Deaver when he was discovered. This doesn't totally explain the character's "mythological connection" to another King work, but maybe The Kid before all of this happened is someone we know, or related to someone we know. Either way, this could explain why Henry and The Kid seem to share memories, why The Kid's eyes are two different colors (a representation of someone else inside of him), why The Kid seems trapped in a childlike state, and why the bad events in Castle Rock started up again when Henry came back to town. If the part of him in The Kid is put back in his body, all hell could be unleashed. In episode six, "Filter," we meet Henry's son, Wendell (played by Chosen Jacobs, who, like Skarsgård, appeared in It). Henry and Wendell have a distant relationship, for reasons still unknown, but they start opening up to each other when the latter comes to Castle Rock for a visit. As Henry puts Wendell to bed one night, Wendell asks his father about being adopted. "Why didn't they have their own kid," he inquires, referring to the Deavers. "They tried," Henry says. "They lost a baby during labor. I guess they didn't want to go down that road again." If we accept that Castle Rock is set in King's multiverse, that means the same location might exist elsewhere, with variations. Perhaps the Deavers' biological child never died in one of those other realities, and Matthew Deaver figured out how to travel between them. Castle Lake, where Henry was found by Scott Pangborn in 1991, could be a portal; it's near that lake where the "voice of God" (as Matthew called it) can be heard, and it's where Dale Lacy killed himself. Is it possible Henry didn't disappear of his own volition, but that his father attempted to swap him with his biological son from another world? If The Kid is from another world, that might explain his abilities and importance, and why Lacy thought he was the Devil -- to a devout Christian, disrupting the laws of nature would be an act of evil. That's all we've got for now, although the possibilities really are endless. 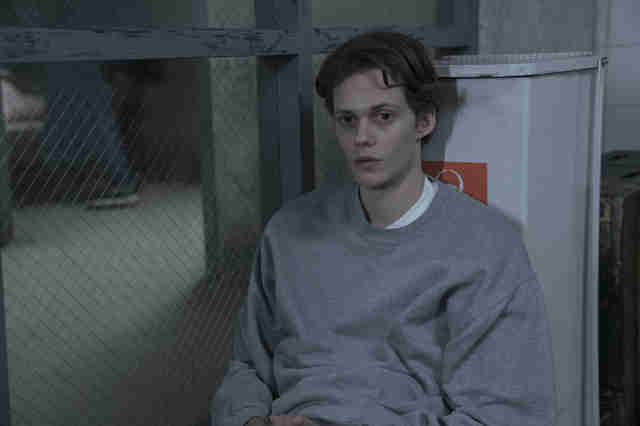 We can't wait to see what further evil awaits us, as Castle Rock continues its weekly Hulu drop.